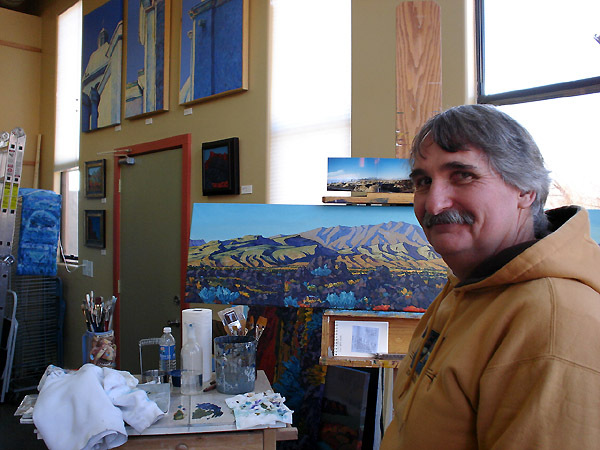 If you aren’t familiar with the brilliant colors and dazzling contrasts in Royden Card’s art, you are missing a very unique artistic expression of southern Utah landscapes. Card, a native of Canada, earned a BFA in painting (1976) and an MFA in painting and sculpture with a minor in design (1979) from Brigham Young University. Card will tell you that he began his artistic journey with woodcuts, and this beginning is evident in his acrylics, which he describes his as “bright, expressionist,” but with “reality in subject matter.” Though Card paints more and more, he continues to be a master of incredible woodcut prints. 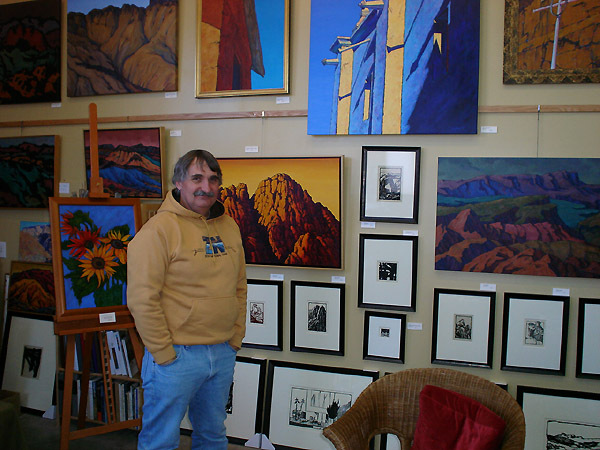 You can view Card’s paintings and woodcuts at his recently opened gallery, Royden Card Fine Art, nestled in Kayenta’s Coyote Gulch, a cluster of artist studios, galleries and cafes about seven miles west of St. George. 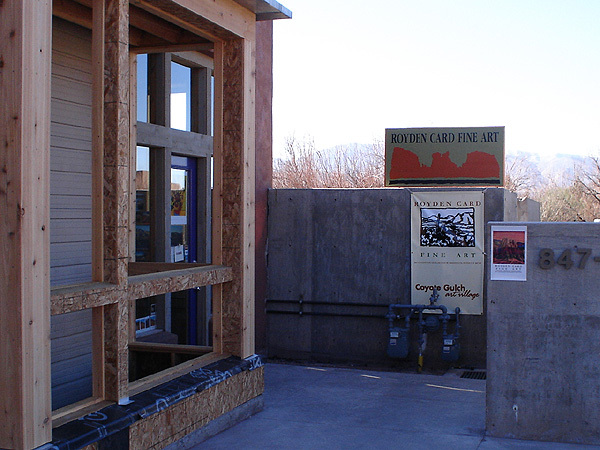 Card decided to locate in the growing Kayenta art community after searching throughout the St. George area and deciding the Coyote Gulch location was a good price for the space available. And with vistas of the Santa Clara Bench and Beaver Dam Mountains, it is a beautiful location for an artist who thrives on panoramic views. Royden Card Fine Art is not your typical art gallery. The first thing you see upon entering is Card’s current “work in progress.” The artist has combined his art studio with the gallery. His brushes, paint tubes, paint cloths, etc., are where he last dropped them — although he says he is consciously trying to keep things tidier than his private studios. Card first saw this type of setup in the Balboa Park area in San Diego. It lends a more casual atmosphere that Card describes as “odd, unexpected.” The atmosphere appears to be working. A big plus to art lovers is being able to meet the artist, which usually only happens at gallery openings; at Card’s gallery, though, you can see him most days of the week. This is Card’s first art gallery endeavor and he comments that being a gallery owner presents its own set of challenges that an artist typically doesn’t encounter: working with the public, keeping regular business hours and learning the value of wall space. A philosophy of Card’s gallery will be to reserve one wall for a guest artist. Currently Jenni Christensen’s “Sunflowers,” are hanging through February 15th. The gallery will feature Fae Ellsworth’s paintings from February 17 through March 31 in a show titled Little Stories (Inner Landscapes). Ellsworth’s work has been described as “wonderfully wild, thoughtful, and intelligent.” She has an MFA in Fine Art from BYU and has taught both art and storytelling at the college level. She currently lives in Virgin, Utah, within minutes of Zion National Park. She combines colors inspired by the mountains around her with stories “appropriated” from massage therapy clients. If you are looking for a break from the cold, you won’t regret a weekend in the St. George area galleries, and more specifically, taking in Coyote Gulch and Royden Card’s new gallery. The February 17-18 weekend is also the 8th annual “Art in Kayenta Festival” at Coyote Gulch, featuring over 90 artists both days from 10am to 5pm. The Datura and Juniper Sky Galleries will also be participating in this event. The simplest route to Kayenta is on old highway 91. Take the Bluff Street exit to Sunset Boulevard which changes to highway 91 just before Santa Clara. The Royden Card Fine Art gallery is open Thursday through Sunday from 11am until 5pm. He is also available by appointment Monday through Wednesday. Lisa B. Huber is a native Utah artist who works in pencil and watercolors. She is also a published poet and writer, works by day as a Software Developer, and resides in Washington City, Utah.